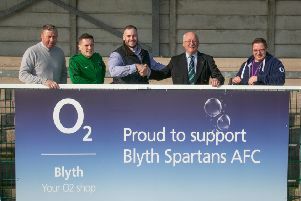 Blyth Spartans fell to their second home league defeat of the season in a disappointing 1-0 reverse at the hands of North Ferriby United. Akeel Francis’ 62nd minute winner from a Joe Pugh’s cross was the decisive moment in a cagey game. Spartans should have had a penalty in the dying embers of the game when Adam Wrightson was pushed over in the penalty area – but came away with nothing from this Vanarama National League North tie. On the stroke of half-time, the visitors should arguably have taken the lead. Francis got on the end of a right-wing set piece, but instead of heading goalward unmarked, he guided his header parallel to the six-yard box and wide. Against the run of play, North Ferriby took the lead just after the hour-mark. Joe Pugh was allowed space on the right wing to advance with the ball at his feet. He reached the 18-yard box before hitting a pinpoint cross into the path of Francis, who steered the ball in from six yards. Spartans tried to push forward in the final 10 minutes, but struggled to create any opportunities. The visitors picked up their first goal and win of the Vanarama National League North campaign, while Spartans look ahead to their trip to Curzon Ashton next Saturday to bounce back from a disappointing afternoon. * Meanwhile, this bank holiday Monday, Blyth AFC are looking forward to a derby match against Bedlington Terriers. It’s at Blyth Town FC (Blyth AFC’s shared home ground) and kick-off is at noon. Entry is £6 which includes a free match-day programme and concessions are available.